One of the most valuable assets an enterprise can possess is data - information acquired and stored in the process of carrying out everyday business activities. This includes data regarding customers and potential customers, employee-related information, data gathered concerning competitors, and information pertaining to products. In order to take full advantage of its information assets, an enterprise must be able to store and utilize data wisely. The SAP Business Objects Business Intelligence suite of applications provides the enterprise with a comprehensive set of reporting and analysis tools that enables timely and accurate presentation of data, including that obtained from SAP and non-SAP information stores. Data may be an enterprise's most valuable proprietary asset. Each enterprise possesses unique data that, when used strategically, provides a competitive advantage. Data can reveal significant information about customer behavior and preferences, and provide insight into business processes that may ultimately influence what a company sells, how products are made, and how they are sold. Getting the most out of this data will determine the ultimate value it provides to the enterprise. SAP BusinessObjects Web Intelligence is one of the industry's most flexible, user-friendly and powerful reporting solutions. It provides ad hoc query, analysis, and reporting tools in a package that is geared toward the business user. You do not have to know structured query language (SQL) to take advantage of the power offered by Web Intelligence. You can easily create and publish high-quality reports that contain drill downs, and allow readers to track changes and share business information across the enterprise. This course provides an introduction to Web Intelligence, highlighting some of its key features and benefits. You will also be able to practice using Web Intelligence tools to perform common tasks. The typical enterprise generates hundreds of management reports on a weekly basis. As companies grow and continue to add new channels, benchmarking and weekly reporting are key to helping top management keep a finger on the pulse of the business. With all those reports to wade through, business executives need a reporting format that provides the information they need at a glance. The corporate dashboard report does just that. It contains a series of dials in a corporate cockpit that reflect the key performance metrics from each department. Dashboarding involves the presentation of key business data in a very concise visual manner. SAP's Business Objects offers dynamic, customizable data visualization tools that allow you to create insightful and powerful dashboards from various data sources. These tools are intuitive and appropriate for users of all skill levels. This course provides an introduction to dashboarding. 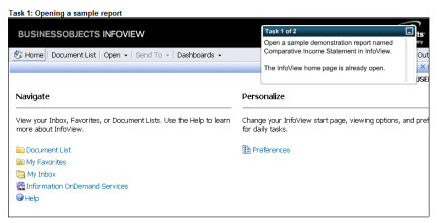 You will learn how to create dashboards using SAP InfoView, Xcelsius, and Dashboard Builder. SAP BusinessObjects provides various tools for enterprise reporting purposes. 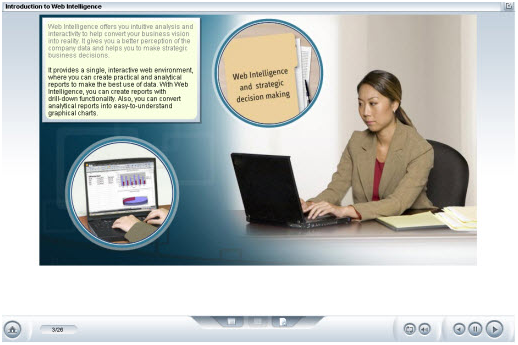 InfoView is a web-based application that provides an interface for users to perform common activities, such as viewing or modifying reports, without having to install any additional software on their systems. InfoView can work with Xcelsius, Crystal, and Web Intelligence documents. It allows you to publish reports to common formats, such as PDF or MS Word, as well as alter a report's underlying data. This course provides an introduction to the essential features and functions of SAP InfoView and provides a look at some of the common activities performed using InfoView. Businesses generate a large amount of data in the everyday operation. This data is extremely valuable and may be used by employees at every level of an organization. Before it can be utilized optimally, it must be formatted in such a way that an enterprise can capitalize on the vast amounts of data in its possession. SAP Business Intelligence (BI) is an enterprise solution that provides businesses with a comprehensive suite of tools to collect and prepare the enterprise's data for reporting and analysis purposes. With proper use of BI, an enterprise may become more organized electronically, spot trends in business, and generally have a competitive edge simply because of its ability to securely and accurately report on and analyze a myriad of data.